New Year’s represents a time for change and growth. Part of this change includes new trends in home design. We’ve definitely seen our share of these trends becoming more popular in our business but have seen these trends popping up in places such as Elle Décor’s list of What’s Hot for 2019 and Flooringinc.com’s 2019 Trend Report. 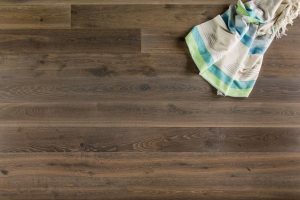 Here are some emerging and growing trends in wood-flooring to take note of for 2019. Lighter-woods are easy to decorate around, you can make your room more contemporary or rustic chic with the same floor color and different furnishings. 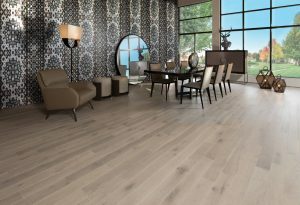 Light-colored wood floors such as the Sweet Memories Collection from Mirage Flooring (shown above) can give your home a light and bright feeling while still feeling timeless. 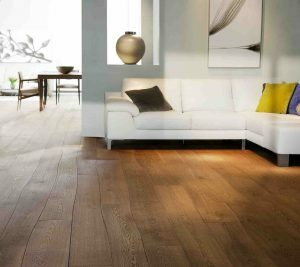 Light-colored wood flooring is its ability to hide dirt, dust and scratches better than darker woods which could also be a reason for its resurgence. Lighter flooring makes your rooms look larger, especially if you go with a wider plank floor. Conversely, darker woods make your room look smaller (think little black dress). Urethane finishes form a layer of protection on top of a floor’s wood surface. Urethane finishes are extremely durable and are easy to clean with a dry mop and hardwood floor cleaner or a solution of white vinegar and warm water. The durability of a urethane finish can make it hard to do spot repairs. Eventually, as the urethane wear layer breaks down, the entire floor will have to be refinished. Oil finished floors need a bit more maintenance with specialized soaps and refreshers to keep the look and protection an oil finish provides. Because an oil finish affects the actual wood, spot repairs on scratches and gouges are easier to do. If maintained properly, an oil finished floor will never need to be stripped and refinished like a urethane finish. Our owner, Jeff Rose, performing the Shou-sugi-ban technique. In-keeping with the trend that homeowners want their wood flooring to look more like wood, it’s natural that the trend of keeping or bringing out the texture and natural character of wood has also become more popular. Wood-flooring with texture has some great benefits, such as hiding imperfections and scratches (especially from little doggy paws). Here are some different texture trends to look for and the differences between them. Hand-scraped – Hand-scraped wood features long, ingrained scrapes in the finish with high variation between planks, making each individual plank appear handcrafted, unique and rare. Wire-brushed – Wire-brushed wood shows subtle, intentional wire scratches that leave the heart of the wood exposed to the surface. These imperfections are smoother and more consistent than hand-scraped or distressed wood. Distressed – Distressed wood is often mistaken for hand-scraped wood. Distressed wood, however, looks as though it’s been through a lot of wear and tear. You can expect to see scrapes, burns, knots, wormholes and more, giving it an aged, antique look. Shou-sugi-ban – This is a Japanese term that literally translates to “Burnt Cedar Wood”. It is the age-old process of charring cedar boards which not only gives the wood a unique, artistic look but it also preserves the wood. We just performed this technique for one of our client’s projects we dubbed the “Party Barn” and we absolutely love the way it adds a rustic, earthy feel to the space. 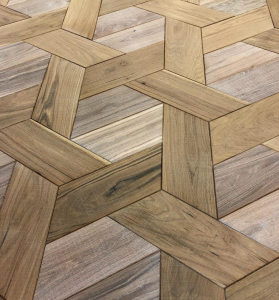 The trend to incorporate a more intricate design pattern into the flooring lay-out itself is one that has continued to grow over the past few years. Homeowners want that custom look and a great way to do that is with a patterned lay-out. Here are some popular patterned styles that we have seen growing in popularity. Herringbone – The Herringbone look is an easy way to take your floor design to another level. Herringbone is achieved by connecting two boards at a 90-degree angle to form a point. 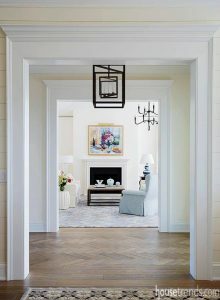 We love this Herringbone floor that we installed or one of our clients. The pattern really adds a subtle but beautiful design element to the foyer. Basket-weave – Traditionally found in grand buildings and chateaux around Europe and particularly in France, basket weave wood flooring is generally associated with wealth and luxury and so exudes a real feeling of quality and charm in your home. Essentially produced using interweaving wood panels so they look like one ‘weaves’ under another, this way of creating wood flooring can be done by hand or to use ready constructed interwoven wood panels. Basket-weave is best used in medium sized spaces as it tends to make large rooms look too large and small rooms look even smaller. Wide and Mixed Plank Widths – The trend for wider plank flooring is one that keeps growing and probably will be around for quite some time. Wider boards help your space feel larger and more open. Keep in mind, when going to a really wide plank-it might be wise to consider engineered wood flooring, which is much more stable due to its internal structure than wide solid wood floor planks that can warp and twist over time. We’ve also seen the up-ward trend for mixed width plank floors, which gives a space a more rustic, natural feel. Live Edge Flooring – Along with wanting that custom and more natural look and feel is the trend to incorporate live edge wood into home design. We’ve seen this trend come up in furniture, bar-tops and has made its way into flooring as well. Bole Floor for example, is a manufacturer that we carry that believes we should celebrate the uniqueness of wood and the character that lives in nature. We couldn’t agree more. At Mansion Hill, our goal is to be a trusted resource to both homeowners and the design community. This is why we stay up-to-date on all of the design trends that affect our industry and make sure we have the best variety of styles, colors and patterns to choose from. 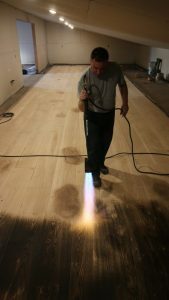 Creating custom, one-of-a-kind floors is our specialty, so if you want something as unique as you are, give us a call-we’re ready for the challenge! Are Your Wood Floors Ready for Winter?